The sequel to the first Who Built America? CD-ROM (1876-1914), Who Built America? From the Great War of 1914 to the Dawn of the Atomic Age in 1946 is a multimedia exploration of three of the most tumultuous decades in U.S. history. Spanning two world wars and the Great Depression, this CD-ROM presents a comprehensive and engaging overview of the history of the period along with an extraordinarily rich body of primary sources: dozens of oral interviews, period songs, speeches, radio programs and film clips, hundreds of illustrations, and thousands of pages of primary text documents. Read Ernest Hemingway’s recollections of World War I. See Dorothea Lange’s photographs of Depression-era America. Hear Franklin Delano Roosevelt declare war, Count Basie play jazz, and the radio sketch that got Mae West banned. View footage of Charlie Chaplin going to war, Joe Louis knocking out Max Schmeling, and Bugs Bunny selling war bonds. 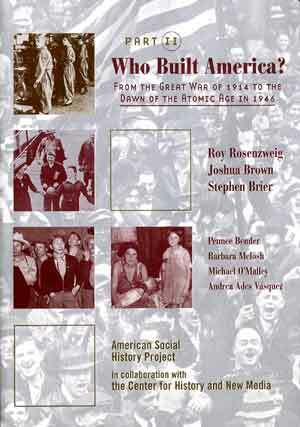 Based on chapters from the Who Built America? textbook, the CD-ROM was produced by the ASHP/CML and the Center for History and New Media at George Mason University, with support from the National Endowment for the Humanities and the Rockefeller Foundation.